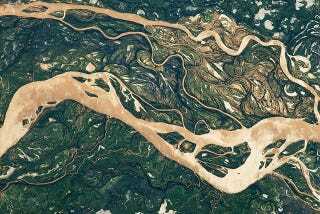 This is but a snapshot in time of the Paraná River in South America, a tangle of green and brown streams, lakes, and abandoned channels. The Paraná River snakes 4,880 kilometres through Argentina, Bolivia, Brazil, and Paraguay. It's wide enough and deep enough to be a major transportation route for the landlocked cities, and marks the border between Brazil and Paraguay, then later Argentina and Paraguay. More importantly, it is simply beautiful. The colour of a river tells the story of where it comes from and what it carries. Clear blue waters no suspended sediment: downstream from a dam, or a river cutting through rocky lands with little dirt and sediment. Muddy water is just that — full of suspended sediment from collecting runoff and eroding soft banks. While the Paraná River has stretches of clear blue water, a muddy wide chunk downstream in the floodplains in Argentina is ideal to explore its long history of shifting banks and flooding waters. The history of the Paraná River is written out in this satellite image. Water-filled channels are muddy brown with suspended sediment clouding the main channel and many partly-filled side channels. The meandering channels grow ever-curvier over time as the fastest water on the outside of turns, eroding the bank, and slowest on the side, dropping sediment. Eventually, the meanders grow so extreme the river jumps the banks onto a straighter path. The abandoned channels oxbow lakes, occasionally refilled with floodwater. Sediment settles out of the stagnant water, slowly filling the lake in. The rich sediment is fertile soil for vegetation growth, tracing even dry channels with dark green vegetation. In this particular stretch of river, the main meandering channels are connected and interconnected by many smaller channels with constantly shifting paths, blurring classification between a meandering and braided river. A single river can be classified as both in different stretches, transitioning from a higher-energy braided river to a lower-energy meandering river as the slope decreases. Braided rivers are capable of carrying a heavier gravels and rolling rocks along its bed, with interconnected channels separated by constantly shifting island bars. When the river finally reaches the ocean in a twist of channels tangling across the delta, it dumps its sediment in the Atlantic Ocean. All images previously featured on the always-excellent Earth Observatory published by NASA. Read more about them in the links provided in the captions.